We spoke too soon, America. Last week we pointed out on Opposing Views that Floyd Mayweather Jr. had been eerily silent regarding how many pay-per-view (PPV) buys he did in his September showdown against Victor Ortiz. You remember, the one that ended with the legal sucker punch heard around the world. Yeah, that one. We suggested that perhaps Mayweather was being silent because he hadn’t done as well as many thought he would. That perhaps the man who has built his career on conquering the boxing world via his irresistible guy you love to hate persona had finally taken it too far and alienated the folks who would otherwise pay to see him fight. As it turns out, that was not the case. In response to the storm we created last week, Mayweather and his team released the numbers for the Ortiz fight and, be warned, they’re very, very good. All in all, 1.25 PPV buys were made to watch the undefeated champ pummel Ortiz for the better part of four rounds – an intake that’s worth somewhere in the $78 million range. Not bad for a guy nobody wants to see. The numbers were just a tick lower than the 1.3 million PPV buys that Manny Pacquiao vs. Shane Mosley generated. And, to be fair, Top Rank boss Bob Arum has already come out on record and said that he expects to topple Mayweather’s recent total. “We’re looking at huge numbers because this fight is going to be another classic,” said Arum of Pacquiao’s looming November 12 showdown against Juan Manuel Marquez. The really interesting part of Mayweather revealing his numbers, though, is that it once again takes the ball out of his court. He no longer needs to actively seek out a fight against Pacquiao because, obviously, he can generate enough fight interest against a nobody like Ortiz without a second major draw. 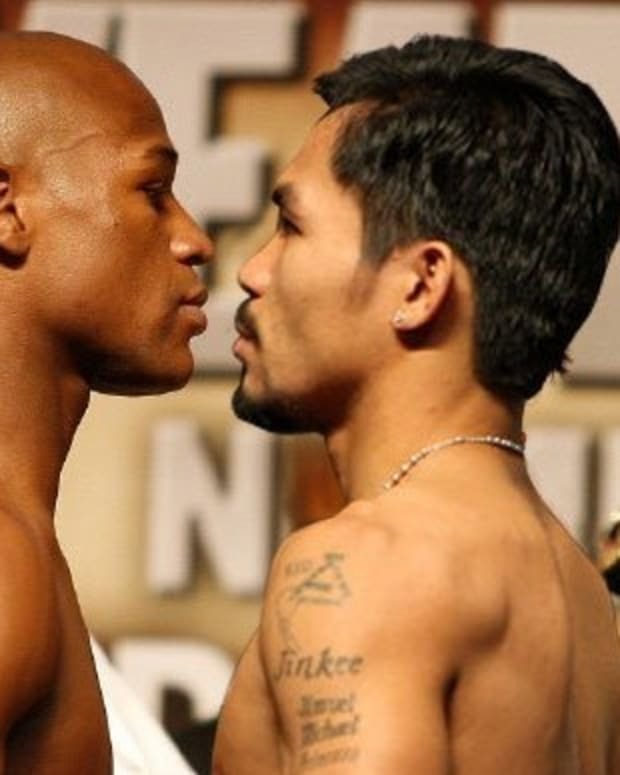 Essentially, the notion that Mayweather needs Pacquiao for a big payday is officially dead. Already, the reverberations from the announcement are being felt. When pressed on how he thinks Mayweather’s most recent totals will impact negotiations for a potential superfight, Pacquiao made a damning statement. To say that 50-50 is the off the table is the equivalent of saying, “I won’t negotiation with him – period.” There is no way Mayweather would accept anything less than a fair, equal split and, frankly, there is no reason should have to. With his latest showing against Ortiz, the undefeated Mayweather proved that he’s as big a draw as there is in the sport – and that he doesn’t need Pacquiao to make money anymore than Pacquiao needs him.